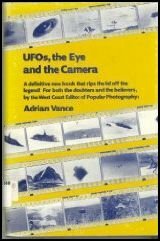 "UFOs, The Eye and the Camera"
Adrian Vance, a former Editor of Popular Photography, wrote the book, "UFOs, The Eye and the Camera" that contained a series of photos similar to George Ritter's in Ohio. On July 5, 1965, a Barry Andersson took the photo below on the Russian River near Anchorage, Alaska at 6 AM, with his 35 mm camera of a disc shaped craft that he estimated to be 30 feet in diameter. Adrian Vance writes, "This picture, with a focal-plane shutter, shows that the disappearance-reappearance mechanism is one that takes place in stages, and that the object begins to appear in the new location while it is still dissolving in the old location or locations. We use the word 'locations' since the Andersson photograph also shows that the device can be in several places at one moment, i.e. part in one spot, part in another and so on." (Page 41). He goes on to speculate that, "The fact that this machine can dissolve in space and spread itself over several locations indicates that its operators have a very high degree of technology. This picture demonstrates that the process proceeds from one side of the object to the other, and that in the interval of the Anderson photograph, 1/125 second, the object was in six places. The fact that they have picked operating cycles that are just beyond human vision indicates that they understand the process in a war, and in terms, that I have not read about before this writing." (Page 49).